From acclaimed writer, Jane Yolen, comes another tale set during the Holocaust. Totally immersive, switching between the viewpoints of twins, we hear from Chaim, as the story of the horror unfolds in Poland during WW2, and from his sibling Gittel, as she recounts her family and life, in the future. 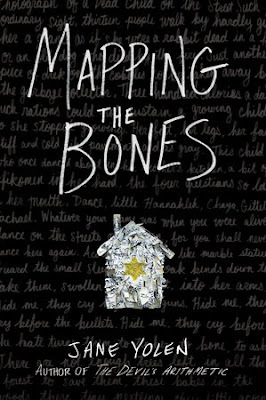 Mapping the Bones has been cleverly mapped. A story of struggle, loss and hope, is weaved into a compelling novel, that will leave readers with a glimpse of a powerful time in history. With powerful poetic prose, Jane Yolen draws in the reader and keeps them engaged. Fraternal twins, Chaim and Gittel, have a bond that is unique. Chaim is Gittel’s conscience. Gittel, Chaim's strength. At the start of the book they are living in the Łódź Ghetto with their parents, barely making ends meet what little food they had to share, and constantly looking over their shoulders for potential trouble. When the rabbi, brings in a new family into their home, they have to learn to share their already meagre portions. Chaim is a sweet boy, who aims to do what’s right and has a slight stutter. He instantly dislikes the boorish cocksure Bruno. Then, when the family receives a “Wedding Invitation” signalling they are on the list of people being deported, they know they must escape. Chaim is tasked with selling his mother’s engagement ring to secure enough for their escape. What follows is a separation from their parents, leading to a struggle for survival. The story has been compared to that of Hansel and Gretel. There a some subtle references, but not overtly so. Sadly, as history grimly informs us, life for Polish Jewish children in WW2 did not often have a happy ending. I loved Gittel’s memory sequences. They were powerful, short, but tied the narrative and characters together. Chaim’s poetry and writing was heartwarming, and a hope filled juxtaposition against a tale of horror and despair.